I know more about snake oil than any person alive!!! concoction, usually giving it an exotic name like snake oil, promising to cure all ills. 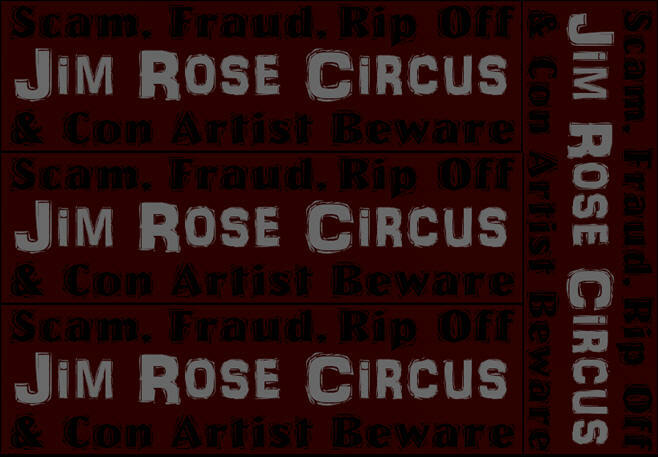 Of course, it was a big scam and eventually the term snake oil came to represent any deceptive product or enterprise. 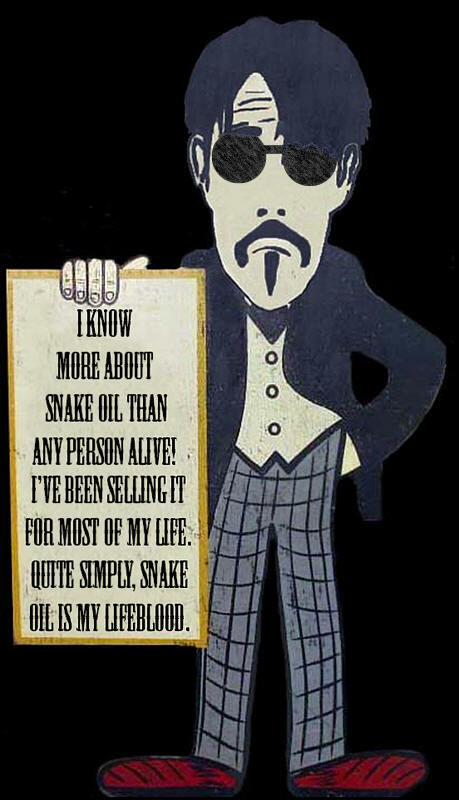 My introduction to the swindle of snake oil began during my formative teenage years. Working at the state fair, I was initiated into the world of eccentrics with a school-of-hard-knocks education in street smarts. In the late eighties, this education allowed me to found the Jim Rose Circus, touring the planet non-stop for fifteen years. During this odyssey of the odd, I became part of a living eclectic encyclopedia. Much of the information you will find in this offering is oral history passed along from hustler to hustler; con artist to con artist; huckster to huckster. By capturing this knowledge in these pages, I’ve ensured that it won’t be lost forever. It might seem like a dubious legacy, yes, but I’m confident it will stand the test of time. The roots of all business and magic can be found in the rook of snake oil. But this is not a “How To” book intended to encourage anarchists, con men or entertainers. Its purpose is to help the brain think in terms of angles. This collection of the strange and risky is not exclusive to Americana. Many of the puzzle pieces have been culled from the weirdness of Belgium, Scandinavia, Germany, the U.K., France, Austria, Holland, Switzerland, Spain, Jamaica, New Zealand, Australia and South Africa. There’s an interesting theory I’ll propose for your consideration. Until the age of about fifty, your head stores itself full with info. After fifty, nature reverses to do some intellectual house cleaning. This process continues until all of the brain’s creases are ironed and polished to the point of not even being able to control drool. One of the reasons I wrote this book now was to preserve some of the interesting clutter before remembering it all became too overwhelming. Another reason stemmed from my frustrations associated with research. And my fear of drooling. My research on mind control serves as a representative example. Brainwashing can be explained clearly in two paragraphs. Or you can take the time to devour a 300 page tome on the subject. Complete it and you’re more confused than when you started. Authors are often guilty of turning a paragraph into hundreds of pages and calling it a book. Some of the subjects in this book fall under this category. Distilling topics with clarity and brevity provides an insightful overview of the craft of snake oil. It starts with this introduction you’re reading now. Snake oil. I’ve learned from the best. Been burned by the worst. Along the way, I’ve even contributed a few of my own inventions. Come and get it . . .
There’s nothing it won’t cure.